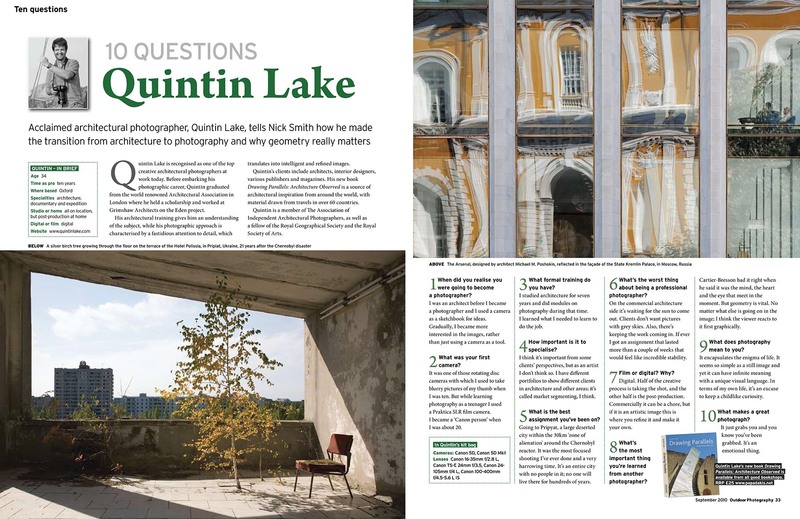 Quintin Lake is recognised as one of the top creative architectural photographers at work today. Before embarking his photographic career, Quintin graduated from the world renowned Architectural Association in London where he held a scholarship and worked at Grimshaw Architects on the Eden project. His architectural training gives him an understanding of the subject, while his photographic approach is characterised by a fastidious attention to detail, which translates into intelligent and refined images. Quintin’s clients include architects, interior designers, various publishers and magazines. His new book Drawing Parallels: Architecture Observed is a source of architectural inspiration from around the world, with material drawn from travels in over 60 countries. Quintin is a member of The Association of Independent Architectural Photographers, as well as a fellow of the Royal Geographical Society and the Royal Society of Arts. 1 When did you realise you were going to become a photographer? as a sketchbook for ideas. Gradually, I became more interested in the images, rather than just using a camera as a tool. 2 What was your first camera? It was one of those rotating disc cameras with which I used to take blurry pictures of my thumb when I was ten. But while learning photography as a teenager I used a Praktica SLR film camera. I became a ‘Canon person’ when I was about 20. 3 What formal training do you have? I studied architecture for seven years and did modules on photography during that time. I learned what I needed to learn to do the job. 4 How important is it to specialise? I think it’s important from some clients’ perspectives, but as an artist I don’t think so. I have different portfolios to show different clients in architecture and other areas; it’s called market segmenting, I think. 5 What is the best assignment you’ve been on? Going to Pripyat, a large deserted city within the 30km ‘zone of alienation’ around the Chernobyl reactor. It was the most focused shooting I’ve ever done and a very harrowing time. It’s an entire city with no people in it; no one will live there for hundreds of years. 6 What’s the worst thing about being a professional photographer? On the commercial architecture side it’s waiting for the sun to come out. Clients don’t want pictures with grey skies. Also, there’s keeping the work coming in. If ever I got an assignment that lasted more than a couple of weeks that would feel like incredible stability. 7 Film or digital? Why? Digital. Half of the creative process is taking the shot, and the other half is the post-production. Commercially it can be a chore, but if it is an artistic image this is where you refine it and make it your own. 8 What’s the most important thing you’re learned from another photographer? Cartier-Bresson had it right when he said it was the mind, the heart and the eye that meet in the moment. But geometry is vital. No matter what else is going on in the image; I think the viewer reacts to it first graphically. 9 What does photography mean to you? It encapsulates the enigma of life. It seems so simple as a still image and yet it can have infinite meaning with a unique visual language. In terms of my own life, it’s an excuse to keep a childlike curiosity. 10 What makes a great photograph? It just grabs you and you know you’ve been grabbed. It’s an emotional thing.